Having enjoyed four consecutive years of annual new-vehicle sales surpassing 17 million units, the automotive industry appears destined for a falloff in 2019. According to National Automobile Dealers Association (NADA) forecasts, 2019 should see sales of 16.8 million new cars and light trucks, down almost 3 percent from 2018’s surprising 17.3 million. 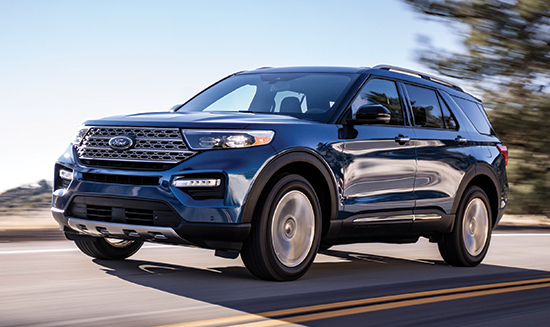 The Ford Explorer features the car company’s largest-ever touchscreen at 10.1 in. As new-vehicle sales slow, look for human-machine interface technologies to continue advancing. Photos courtesy of Ford Motor Co.
As president and CEO of Thomas Publishing Co., LLC, provider of product sourcing, supplier selection and marketing solutions for industry, Tony Uphoff stays abreast of global trends, issues and policies affecting automakers and their suppliers. MetalForming recently asked Uphoff for his insights on tariffs, China and how both could affect automakers and U.S. manufacturers. MetalForming: What is your ‘crystal ball’ telling you when it comes to tariffs and China? Uphoff: With the recent extension of the trade-agreement deadline between the United States and China, there is reason for cautious optimism in the industry. There’s also a lot of uncertainty, because a possible doubling of the existing tariffs on steel and aluminum—as is promised should an agreement not be reached—as well as potential new U.S. tariffs on automobile parts and finished vehicles, almost certainly would bring about a similar response from China, as well as Canada and Mexico. All eyes should be on what President Trump decides regarding the Department of Commerce’s recommendations (not yet released to the public) on whether imported vehicles and parts pose a national security risk. If the report shows the situation to be a threat, President Trump has 90 days to decide whether tariffs are an appropriate response. Analysts have reported that if the administration decides to impose a 25-percent tariff on imported parts and vehicles, the price of imported vehicles will rise by more than 17 percent, while prices for U.S.-made autos—many of which use imported parts—would increase by about 5 percent. Analysts believe that this would cause sales to shrink by roughly 1.8 million vehicles/yr. through 2026. I am hopeful that the issues can be worked out in a mutually beneficial way. The fact is our two economies are interdependent; neither country can really grow its gross domestic product without the other. In terms of sourcing, our data shows that U.S. manufacturers throughout the automotive supply chain are increasing their reliance on domestic sources of supply—from metal stamping, fabrication and plastic injection molding, to electrical wiring harnesses, steel tubing, powder coating services and countless more. MetalForming: U.S. automakers sold more than 280,000 vehicles in China in 2017. Do you have a projection for 2018? 2019? Uphoff: Last year was rough for the car industry in China overall, the world’s largest automobile market. Sales there totaled just 22 million cars, a drop of 6 percent from 2017 and the first decline in 20 years. While total U.S. vehicle sales actually rose 0.6 percent in 2018, look for a bit of decline in 2019, with the slowdown in China being one of the drivers of that trend. There are a number of reasons for the slowdown and many have nothing to do with the trade war, including cancellation of a government tax subsidy on car purchases and the elimination of many nonbank, peer-to-peer lending platforms leading to a credit squeeze that definitely had an impact on car purchases. These factors, and the uncertainty of the ongoing trade war, make predicting U.S. vehicle sales in China a guessing game. MetalForming: What are your projections for auto suppliers in terms of sourcing activity? Uphoff: Whichever way the trade war shakes out, one could reasonably predict some positive impact for suppliers within the automotive supply chain. If new tariffs are imposed on imported goods, we expect the current trend of U.S. manufacturers increasing their reliance on U.S. supply sources to continue. Should the trade war come to an amicable resolution, then that would bode well for the economies of all the countries involved, which would be a positive environment for U.S. suppliers up and down the automotive supply chain. In terms of being competitive or perhaps even thriving in the current business climate, stampers and fabricators should see to it that their marketing strategies ensure that they’re reaching buyers and engineers at every stage of the industrial buying process—not only when those buyers are ready to buy. Industrial marketing is well into a digital transformation; it is not enough to just build a website and wait for leads. Our data shows that today’s industrial buyer is as much as 70 percent of the way through the decision-making process before it contacts a supplier. Smart, integrated digital marketing strategies reach and influence buyers, from the earliest part of that buying process right up to and through the sale. “The growth of electric vehicles has significantly changed the list of materials and products automakers need to source for their manufacturing process, creating new opportunities for suppliers,” adds Uphoff. Serving as an example: frame configurations made of lighter, high-strength metal alloys that support components and occupants. “Stampers and fabricators should do all they can to stay abreast of where innovation and technology are taking the industry, and align their capabilities and offerings to capitalize on those opportunities wherever possible,” Uphoff says. 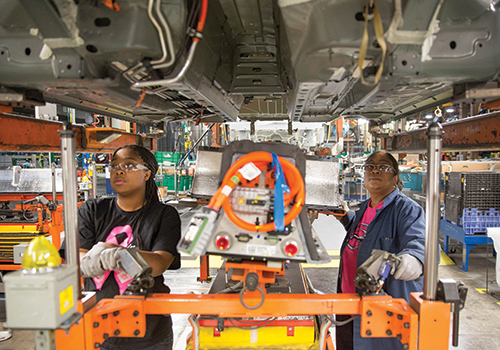 Employees at General Motors’ Detroit-Hamtramck assembly shown installing lithium-ion battery packs. 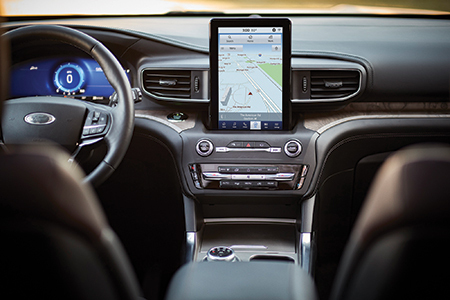 Photo courtesy of General Motors Co.
Another trend to watch, according to a Global Market Insights (GMI) report: automotive human-machine interface (HMI) technology. Gesture control, speech recognition and augmented reality are some of the key features of HMI technologies, with the interface serving as a portal for the exchange of information, converting raw and unorganized data into actionable data. A recent IHS Markit survey of 120 automotive executives in Asia, Europe, Latin America and North America shows that when it comes to implementing any or all of the above-mentioned technologies, higher quality finishes first as the most important benefit, with lower overall cost (materials, labor and energy) and shorter lead time to market finishing second and third. Customized products and increased production-line flexibility received fewer responses, and lower inventory came away with the fewest. The survey also revealed challenges associated with transformative technologies, with respondents citing as the greatest challenges: insufficient employee skills/knowledge, high costs and ROI uncertainty. Among the lowest-ranking challenges: interoperability issues, unsupportive leadership and unproven technology. Zhou considers the top challenge—insufficient employee skills/knowledge—to be “the major bottleneck” when it comes to deploying transformative technologies and advancing trends such as electrification, connectivity and software. Furthermore, cost concerns and ROI uncertainty “will influence the transformative technologies penetration rate and deployment timing,” he says. Nonetheless, Zhou sees a bright future ahead for transformative technologies employed by automotive companies and Tier Ones. He predicts increased integration of industrial robots with industrial-automation solutions, driving the market for machine components such as motion control, motor drives, linear motion products, gearbox, pumps, sensors, machine vision and various controller products. Not to be outdone by the likes of Lyft and Uber, BMW and Daimler announced in February a European joint-venture car-sharing program. Photo courtesy of Daimler AG. 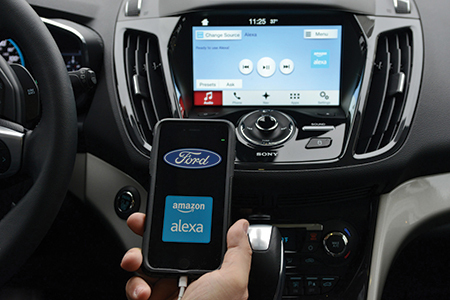 Ford, along with a growing number of automotive companies, are helping to advance automotive human-machine interface technology as it researches more ways for Amazon’s Alexa to enhance the driving experience. Photo courtesy of Ford Motor Co.
Once again, CEOs, presidents, owners and other senior-level executives from automotive-sector companies will convene in Detroit, MI, April 29-30, for the Precision Metalforming Association’s Automotive Parts Suppliers Conference. Here in the heart of the Motor City at The Westin Book Cadillac, the 26th annual event promises much in the way of educational sessions, networking opportunities and group discussions on new technologies, trends and economic issues affecting the automotive industry now, and in the future. Other benefits afforded attendees include timely automotive-industry trends analysis, production forecasts to help develop marketing plans and important benchmarking information. • David Klotz, newly appointed president of the Precision Metalforming Association and former president of Tebis America, a CAD/CAM software developer for the tool, die and mold manufacturing industries, launches the proceedings. • Nigel Francis, CEO and executive director of Detroit-based LIFT–Lightweight Innovations for Tomorrow, one of the founding Manufacturing USA institutes, shares updates on automotive materials and lightweighting. Francis has more than 35 years of experience in the global automotive sector, having held executive-level positions at OEM and Tier One companies in North America and Europe. • Mike Jackson, executive director of strategy and research at the Original Equipment Suppliers Association (OESA), provides an industry outlook. As OESA’s executive director, strategy and research, Mike Jackson leads the association’s data compilation and analytics, identifies and researches industry trends, produces relevant analysis, and speaks regularly on economic and related industry trends and analysis. • Omar Nashashibi, a founding partner at The Franklin Partnership, LLP, the bipartisan Washington, D.C.-based government relations firm that represents PMA interests, updates trade and government policies affecting manufacturers. With nearly 20 years of experience working with policymakers, politicians and the media, Nashashibi delivers insightful analysis. • Dan Sharkey, partner at Brooks Wilkins Sharkey & Turco PLLC, examines legal and regulatory developments and their impacts on automotive suppliers. As his firm’s cofounder, Sharkey has negotiated and litigated hundreds of manufacturing supply-chain disputes, ranging from OEMs versus Tier One suppliers to raw-material suppliers versus lower tiers.